Mnajdra and Hagar Qim are the prehistoric UNESCO protected temples. They are consider to be built between 3600BC and 2500BC, much older and much more sophisticated than the pyramid of Giza or Stonehenge. The complexes are situated at only a distance of 500 m. The temple administration offers both guided or audio tours for the tourists interested of supplementary information. Hal Saflieni Hypogeum is a burial complex of the same age as the prehistorical temples of Mnajdra and Hagar Qim. It is an underground burial cave manually cut in stone, which is considered to have held over 7,000 bodies, deposited over a period of 1,000 years. Mdina was the first inhabited fortified capital city of Malta. It was started during the Bronze Age, expanded and modernised by Romans, but also suffered important influences from Christians, Arabs and 16th century Knights. The fortification was home to many noble families, which had their houses built on labyrinthine streets, which are a pleasure to explore. The fortification holds the Bastion Square and two cathedrals, which lets you see the place from above. In the evening tourists are welcome to have a dinner or a drink on the locals restaurants. The Cathedral Museums holds an impressive silver collection of religious objects, swords, woodcuts or copper plates signed by Albrecht Durer. 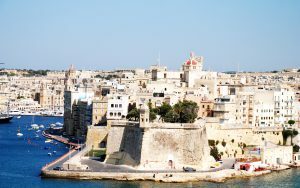 Valletta fortification was built by the knights of the order of St. John. The thick wall fortification stood over 200 years as shield for many enemies, which did not dare to attack from the sea an impenetrable fortification built on the rocky peninsula. St. John’s Cathedral is a beautiful place of worship built in baroque style by the Knights of Malta. The outside seems to be rather plain, influenced by military architecture, but the interior is rich, covered in expensive materials, such as gold or marble of different colors.